A friend of mine received his copy of the February issue of Martha Stewart Living magazine in the mail yesterday and hastily exclaimed his reaction when he sent in the image: "Not what I would expect for a February cover." I'm afraid I have to agree. In my opinion, this cover is perhaps the most unattractive cover in the history of Martha Stewart Living. Not only is there no hint of Valentine's Day (not even in the text) but the image itself is off-putting: a group of croque-monsieur sandwiches clustered together on a parchment-lined baking sheet. It isn't artful. It isn't cheery. It isn't even appetizing. As delicious as croque-monsieur sandwiches are (I've had one - they're great!) I am turned off by the sea of greasy, melted cheese and that slippery fried egg in the image. I don't want this on my coffee table. From a design perspective it falls short. The text is lost in the visual clutter and the colour used for the masthead is jarring. I'm sorry if this sounds harsh, I just love this magazine so much that I want to see it shine and succeed. This cover was a misstep and a lost opportunity to bring readers something delightful for one of the bleakest months of the year: a pretty craft, an alluring bouquet, something other than a tray of ''ooey, gooey cheese". I'm tired of food covers and I'm hoping the editors at Martha Stewart Living start dreaming again, pushing the visual boundaries and raising the bar to recapture some of that magic. Burpee has similar picture on 2015 catalog. Could it be that publishers just don't know their public? I concur. That would be an acceptable image for the food section of the magazine, but the cover? With all the creative talent there, that's the best they could muster? Even if the cover weren't littered with red and pink hearts, I think they could have done something visually more inspiring. I just Googled the Burpee catalog. It's 10 times better than this cover. I just question the decision-making process at this point. Compare this one to previous February issues and you'll be left scratching your head. I just don't understand.......how can the editor believe is is an acceptable composition for the over of any month of the year , but in particular Feburary . Maybe it is selfish to want the magazine to thrive as I want to be able to enjoy it as I once did. Unfortunately they are making it more and more difficult. Oh Andrew, I am sad and very disappointed. I wish there could be a chance to change it. APM, your PS made me giggle! Wait a minute-- if one saves years and years of magazines-- Red every Feb with a heart-shaped something or other..... is Valentines day the only thing that happens in Feb??? Well in the USof A it is Black history Month, several Holidays and is it not the beginnings of gearing up for Mardi Gras... Feb is the "dead" of winter and well comfort food is welcome, no? No hint of Valentine's Day? Does anyone think this has anything to do with the Meredith Corp. take over? It's doubtful. In the original statement that was issued, they stated that the editorial/design content would be 100% handled by MSLO. The business operations are handled by Meredith. But perhaps there was a nudge or two on Meredith's part to opt for a food cover, since they tend to sell more newsstand copies. The irony of "CUT THE CLUTTER"
Anonymous..".yes there are other celebrations that take place in February, and yes the world is an ugly place, but we are discussing a magazine of style, crafts and beauty. In some people's opinion the visual just does not fit! Lately every trendy restaurant, pizzeria, and cookbook seems to feature something with an egg on it, so this may be just MSL's way of trying to fit in. I don't like eggs, so this trend is very unappealing to me. I agree that it doesn't fit their usual style. February issue of Consumer Reports just arrived with heart-shaped balloons and pink ribbons on the cover! Who would have guessed?! Happy New Year! I don't know if you have seen the cover of the Jan/Feb issue of Every Day with Rachel Ray (who is owned by Meredith), but the cover is very, very similar to the Feb issue of MSL. I don't mind not having hearts and I love to cook (still miss EDF! ), but the MSL Feb cover is definitely not the most visually appealing cover. I am very disappointed with the changes to the magazine over the last couple of years. My subscription is up for renewal in March and I am still trying to decide if it is worth renewing. I am in the same boat, Catherine. My renewal is coming up soon and after 15 years I'm actually considering stopping my subscription. I still enjoy the magazine but not as much as I used to. I too wonder if I should renew my subscription. Sadly, I wouldn't mind the thought of Living coming to an end. I would however love to see 4 special newsstand issues a year. Although a bit more pricey, they are nice, thick and pretty much ad free, (bookazine). Martha Stewart Spring, Martha Stewart Summer, Martha Stewart Halloween, and Martha Stewart Holiday would be good ideas. I still love the magazine, but has anyone noticed that the SiriusXM radio shows featuring Martha and her staff have been reduced to only 5 hours per week, and not even reruns? I miss variety of the hour-long TV shows and the many different radio shows that used to be on SiriusXM. Anonymous I love your idea of the seasonal issues. It's a thought I've had before, too. Bigger issues with more content and fewer ads, like Sweet Paul or Kinfolk. Sorry to place "my two cents in "" again on this one blog, but there is something odd going on at MSL. beauty In various aspects. Those blogs have all become eratic , now the Sirius Chanel content , the ever diminishing content in the depth of the magazine articles. Are we looking at a very slow demise of the company and brand? My subscription was just renewed, but it may be the last as I see very little interest from MSL Corp in keeping the spirit of their business. I couldn't agree more with the last comment. We were all initially taken by the beauty of Living. We were inspired and I know I gleefully looked forward to every new issue. After 20 years, I have let my subscription lapse and I will not be renewing. While merchandising was almost always a focus, the new vision of MSLO leaves much to be desired. I placed regular orders from Martha By Mail, purchased MSL products at KMart, but today the company is spread far too wide and far too thin. With energies and funds being placed in those areas the content has suffered. I miss the days of content laden magazines, beautiful photos, inspiration, and unique products. Seems those days are gone forever. Martha, what's going on over there? This February cover is not inspirational or beautiful! Hey, it's not a bad photo for a recipe section, but as the cover it's a strange choice. I also note that I am less and less interested in the content - the articles are just so fluffy and brief. Where old issues have pages long collecting articles, lovingly describing the items, now there is one page of pictures with the advice to "google" a term! Luckily I have almost all the old back issues from late 90's and early 00's, which fill the void. Anonymous, I remember that caption that suggested to Google a term to learn more about it. Seriously?? I'm buying a magazine to tell me to Google something? Wow. It was made worse by the fact that MSL used to be the leading provider of information (actual, well-researched information) that I couldn't find anywhere else. Not so anymore. And, has anyone noticed that Martha's blog has not been updated in a week? Very sloppy and is something that would never have happened in the past. Martha and the company was always very exacting and had high standards. Now, not so much - very disconcerting. Martha and Co set the standard to what we now see in well-maintained blogs and websites. They're missing the mark where they need to adapt and change. The capability is still there, just look at Martha's Entertaining. Beautiful book. Why not use that attention to detail and produce something different? It's been mentioned in the past about producing a seasonal, quarterly magazine. Perfect idea. With so much information we might not need an average publication monthy, but a spectacular issue every few months reminiscent of Martha's Entertaining would be welcomed. But again, the company seems to be moving past information in lieu of standard products in average stores, lower costs higher profit. It seems the company is going to be run into the ground as soon as the mortgage on Cantitoe Corners is paid in full. Catherine, I have noticed, yes. I know that Laura, Martha's sister, used to run the blog. Since her death I think it's been hard for Martha to find someone who can run the blog with as much passion and devotion and regularity. The blog was really Laura's baby. Andrew, I realize Laura handled the blog and I can imagine how awful it must be to even deal with trying to replace her dedication. But this is MSL and their should be enough talent to have someone address the blog(s) as it also part of marketing. I will say that while my "complaints" about the magazine/blogs are heart felt , I am sorry that so many people have also the same feelings since if Martha's fans** Feel this way and have given up support, what hope is there! Re. Martha Blog: At the beginning of today's "Ask Martha" Sirius radio show Martha apologized for not posting a blog this week. She explained that she had been very busy and her blog helper has retired and she is in hiring process. BTW, she is on Today and Steve Harvey today, rerun of Seth Myers (with juicer disaster) tonight. Speaking of the blog--I didn't start reading it until about a year or so ago. There are tons of great posts but any of the ones from about 2008 and earlier--I cannot pull up the pictures at all. I have emailed Martha's website support 3 times about this and never gotten a response. I explained how much I enjoyed the blog and that I'm sure someone with such high standards as Martha would be upset to know there were errors on her webpage. Does anyone else have this problem? Yes, I have the same problem with posts earlier than 2008. I wonder if it's a server error or a default action to minimize the amount of image data the blog can store. Posting dozens of photos every day for 7 years adds up to a lot of data! 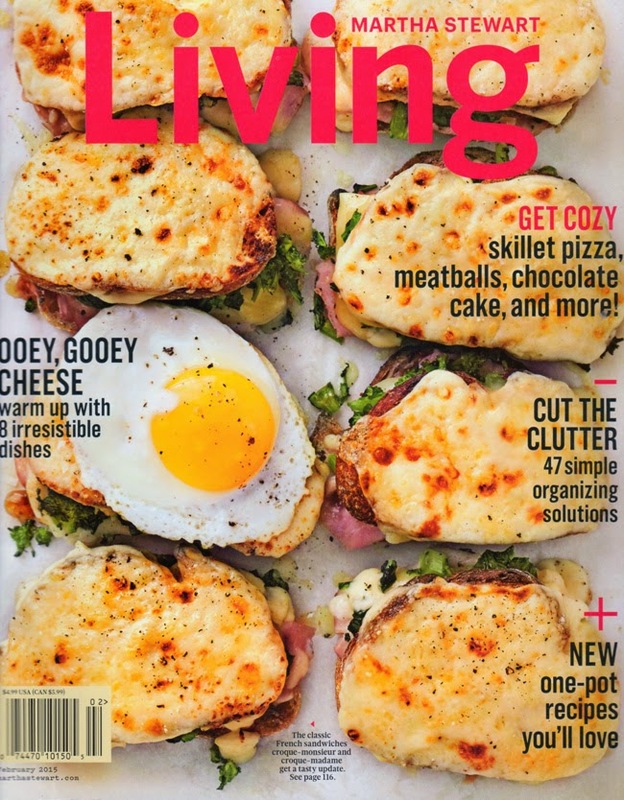 To me, the odd thing about the February cover is that the recipes for the French "croque" sandwiches featured on the cover are not included in the magazine. The recipe is on page 116, as noted on the cover, but it's way at the back of the magazine and not shown in any prominent way.